What'd you do this time, Arbiter? Master Chief understands the eternal bond between a human being and his alien buddy with quad-faceted jaws. 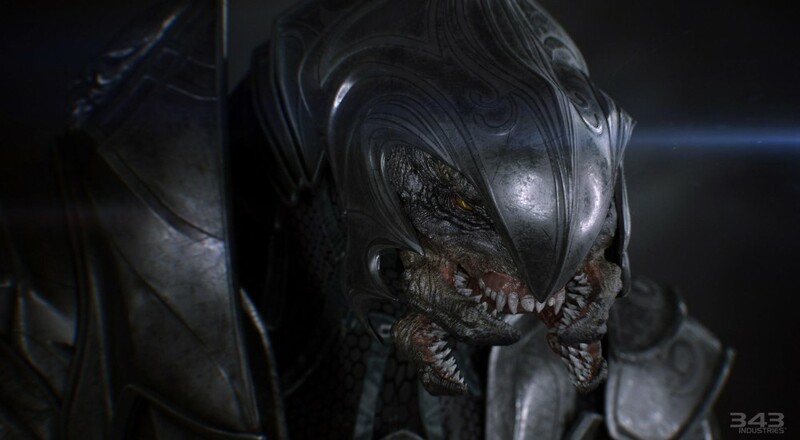 Arbiter has been a big player in the Halo canon since the second installment, always tagging along with Chief and blasting Covenant on command. Also, he's got a voice that could melt caramel. Arbiter makes his return in Halo: The Master Chief Collection alongside his favorite human-ish partner, and he's got some things he'd like to get off his chest. Did you enjoy prowling through the expansive levels of Halo 4 searching for Terminals? Let's hope so! The Master Chief Collection will feature new Terminals spread throughout the games; namely 2 and 3. Dedicated players will need to find these shiny new screens if they wish to piece together the mysteries surrounding the Arbiter. Halo 2 and 3 saw Master Chief's best bud as the second player in the brutal war against the Covenant. The ending of Halo 3 saw Chief adrift in space without his trusty Sangheili partner, which meant Halo 4 picked up with Chief alone. How did the writers at 343 Studios fit co-op into the campaign of Halo 4? There just happened to be a second Spartan inside the fuselage who wakes up about the time John does, to which there is no explanation and none of the characters acknowledge. Maybe Halo 5 will see Chief and Arbiter reunite and embark upon more buddy-cop adventures. Page created in 0.2396 seconds.